Surprise Mail, Kitchen Updates & A Reveal! 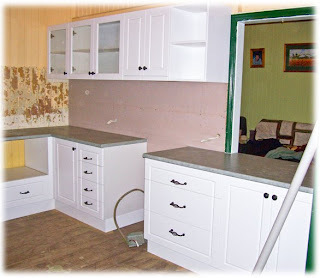 Renovation Update & A Sneaky Peek! As the end of the month crept towards me, I kept looking at my sidebar list of OPAM Challenge finishes and the big fat ZERO for July was making me sweat!! Thankfully, I managed to get my act together this week and finished two projects - YAY!! 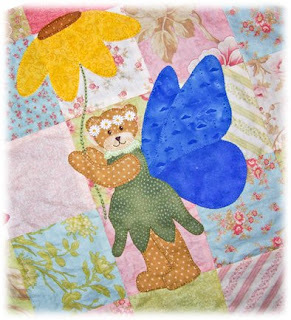 The first was my "Fairy Bears & Butterflies" quilt. 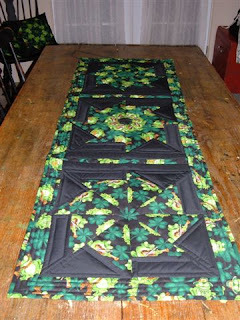 I got it back from Rosalie and once again, she has done a FANTASTIC job on the quilting!!! So then I had to fight my way into the sewing room (still piles of kitchen 'stuff' piled in there waiting for the kitchen to be completely finished!) and stitched on the binding. Wanna see the finished result??? If not, you'll just have to scroll past, cos I'm going to show you anyway! Tee! Hee! Hee! Ta Da!!! 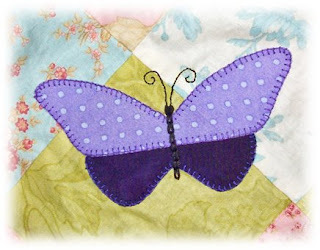 I got Rosalie to again use the butterfly meander in the centre of the quilt, since butterflies crept into this design, too (Rosalie says I have to pick something different next time or people will think she can only quilt in the butterfly meander pattern and she has 100's to pick from! Tee! Hee! Hee!) 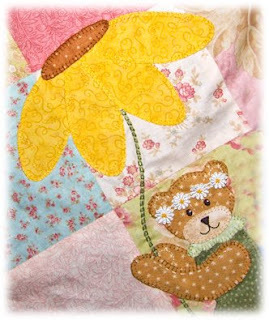 and she quilted a cool, loopy daisy along the borders that looks GREAT!! Thanks Rosalie!! The binding is a pretty stripey fabric I got from Marian at my home-away-from-home, Quilters Angel and picks up several of the colours from the quilt fabrics. I LOVE how it's come up and now just have to write the destructions ... er ... I mean the INSTRUCTIONS! Tee! Hee! Hee! As I said to Marion, I may self-DESTRUCT before I finish writing the INSTRUCTIONS! :0) Will make a start on the weekend, so stay tuned for the pattern release and, of course, a give away in the next couple of weeks. This was a little house-warming gift for Miriam of Bubba Chenille because she and Mr Bubba have bought a new house down the range a bit and in amongst her running around to craft markets, Miriam will be packing and re-locating in the next little while. And I got to give it to her today when we met up at our favourite lunch destination, the Chocolate Cottage at the Village Green. Oh! What do you know ... the Quilter's Angel is at the Village Green too - what a COINCIDENCE! NOT! Tee! Hee! Hee! Miriam and I had a FABULOUS time! We both enjoyed a bowl of YUMMY seafood chowder with fresh toasted crusty bread while sitting in the sun chatting and sipping on drinks - a very civilised way to spend a lunch hour ... or two or three! Tee! Hee! Hee! No photos cos we were too busy chatting ... and the SLR camera isn't exactly COMPACT, so doesn't fit in my handbag like my little lost point-and-shoot. It was lovely to catch up with Miriam again and hear all the exciting Hand Made Expo news and THIS time, we allowed enough time for a browse through Marion's shop. I was a good girl and resisted temptation ... TODAY!! :0) But I think there are some yummy new fabrics there that have my name on them for next visit!! Thanks for a WONDERFUL lunch play date, Miriam!! So ... that's what I've been up to, but I dare say the next couple of days will be full of blog-hopping as I check side-bar lists for monthly finishes, since it's my turn to choose the end-of-month winner for the One Project A Month Challenge. All OPAM gals need to make sure their sidebar lists of finishes are up to date, cos if your finishes aren't on the list ... they won't be counted! You can also send me an email with your list if you have time and that will save me going too cross-eyed from staring at the computer screen. Right now, however, I need to go and write a shopping list, cos it's that exciting time of the week again where we go GROCERY SHOPPING!! Did you hear GB groan (even though he's not here!!) Tee! Hee! Hee! He's really not fond of grocery shopping, but I drag him along with me to drive the trolley - they never go where I want them to go! My justification is: if he wants to eat, he can help me shop! :0) Meanie, aren't I! Tee! Hee! Hee! 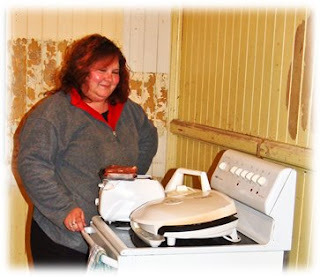 Hope you have fun things planned for your weekend - I think we're tackling the painting in the kitchen, so I may have more reno photos to share next week, but I'll be back in a couple of days with the OPAM draw winner, so ... STAY TUNED!! Til next time - Bear Hugs! 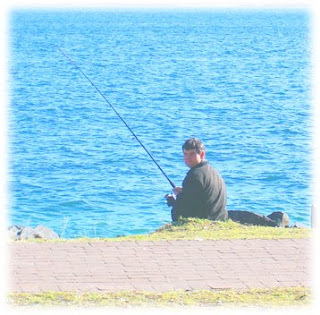 I was going through some of my photos yesterday and discovered a folder I've neglected for a while - one with photos sent to me by some of our "No Blogger" OPAM Challenge participants. OOPS! There are quite a few in this folder that I don't think I've shared, so I thought I'd better do that ... before I forget again!!! Before I show you the photos of some of the gorgeous things people have been making and finishing for the OPAM Challenge, I'd better preface this little showing by telling you that I've forgotten who sent me some of these and only have the file name to go by - SORRY!! If you're one of the clever-clogs who've sent me these photos, feel free to pop a comment on this post to tell us about them. 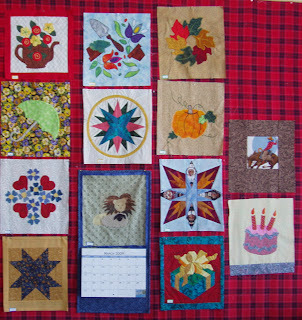 Cheryl T's Christmas Quilts. Hmmm ... I was trying to remember which "No Blogger" this yummy photo came from when it occurred to me that the only Cheryl T I could think of is the lovely Polka Dots & Rick Rack Cheryl T. Now she obviously HAS a blog, so I must have just decided this these Christmasy goodies were too pretty NOT to share! Tee! Hee! Hee! These next few photos are from Mary in Wyoming ... where it SNOWED in SUMMER!! EEEK!!! 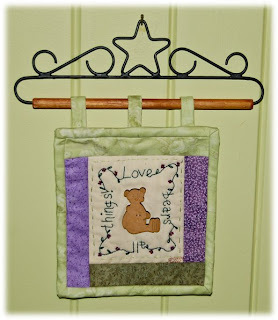 This is a calendar holder that Mary made, with a different mini quilt for each month - lots of work there! Isn't this pretty!! 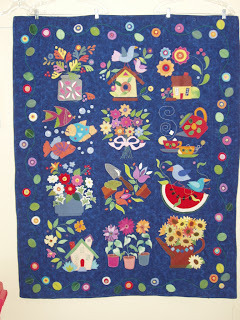 I love the effect of the brighter colours of the applique against the navy blue background. 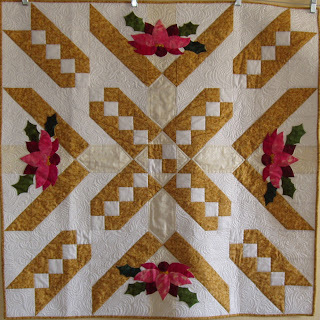 This is Mary's "Summer Fruit" quilt - yep ... Mary sure has been a busy bee!!! :0) But wait ... there's MORE from the prolific Mary!! 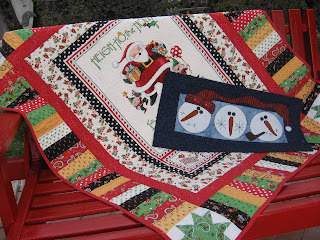 This is a pretty table runner Mary made - looks like it would be a fabulous Christmas show-off piece! :0) All of that snow in Wyoming must encourage Mary to stay inside and stitch, I think!! Tee! Hee! Hee! Lovely job, Mary!! These next few photos are from Sheila. A pretty and practical patchwork pouch! OK, so it's really a BAG, but that didn't continue my line of "P" words!! Lovely bright colours here to cheer up any day ... especially if you were taking that bag fabric shopping! Tee! Hee! Hee! This is Sheila's "Bunny Quilt". The light from the flash hides the centre panel with the bunnies on it a bit, but they sure are cuties! And the lovely soft colours would make this a fabulous addition to any nursery. 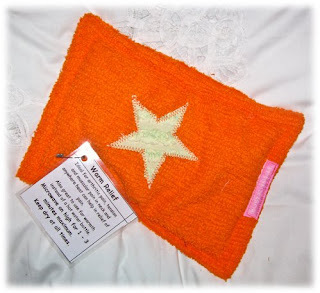 This is Sheila's "Pram Quilt" - that's it's name AND it's purpose - how clever! :0) Again, Sheila has used those soft pastels and the pinwheels look great with the white for contrast. 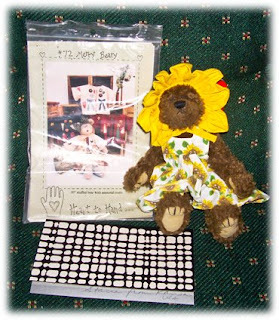 These last couple of photos are from Stacia, who sent me the cute Sunflower bear and pattern recently. 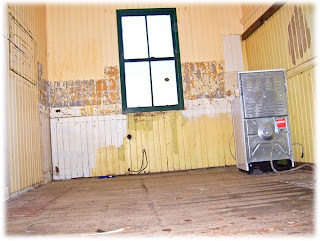 We've also commiserated over how disruptive renovations can be, as she's been doing some major reno's at her new place! 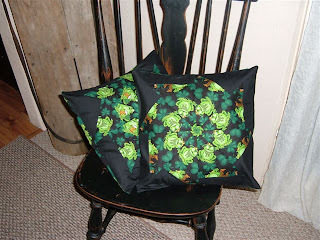 You may have to click on the photo to see these a little clearer, but the green parts of these cushions are bright green froggies sitting on lily pads!! They are so darn CUTE!! (When they're on fabric and not live ones on my toilet seat, that is!!) And the greens show up so well with the black for contrast. These are only a few of the projects that May Britt and I see photos of at the end of each month - there are SOOOOOOOOOOOOOO many more out there if you blog hop through the OPAM Challenge Participants list. It just blows me away how many clever-clogs stitchers there are out there and that through blogging, we get to share and be inspired by so many like-minded people! And there are also a lot of stitchers out there who may not have been posting photos of finished projects, but have been making some progress on larger long-term projects, which is also fabulous. Hope you're all enjoying being part of the One Project A Month Challenge! And now ... I'm off to find my morning coffee, hang some washing and then get busy stitching the binding on a certain quilt ... which is back from the quilter's and looking FABULOUS!! If I can say that and not sound too impressed with myself! Tee! Hee! Hee! So, I hope you enjoyed the photo show and that you're having fun today, whatever you're doing. Til next time - Bear Hugs! It's a cute little cottage that's right on the river - if you take 20 paces from the back steps ... you'll land in the water! 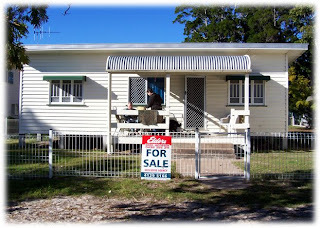 :0) See that back verandah? THAT'S where I spent most of my holiday - sitting in the sun with a book, some stitching, enjoying leisurely breakfasts or sometimes ... just sitting and soaking up the sun! I think maybe I'm solar-powered! Tee! Hee! Hee! It was a lovely, relaxing week - GB and Dad did 'Boy' things, Mum and I did 'girly' things ... and Lily and Wombat did 'doggy' things! I would love to share more photos with you, but I've currently lost my camera (these photos had already been saved before camera loss!) - it's not 'LOST' lost, it's just 'MISPLACED' lost ... I hope!! I'm pretty sure it wasn't left behind, so it has to be amongst our luggage ... somewhere ... I hope!!!! EEK!! How will I blog if my camera is gone!!! I'll have to take a university course to work out how to work GB's recently inherited digital SLR camera - I'm DOOMED!!!! This week is back to reality ... well ... our version of it, anyways! :0) Back to work, back to re-constructing the destruction Zone of our newly renovated kitchen and ... hopefully ... some stitching. Hope you all had a great week last week and that this one is off to a flying start! Til next time - Bear Hugs! Now to the last part of my title ... a reveal. No, not the kitchen! I've been teasing you with sneaky peeks of my newest quilt design (which is with super-quilter Rosalie in the line up to be quilted!) 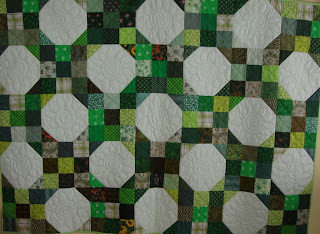 so I thought I would reward your patience with a peek at the finished quilt top ... ready? Oooohh ... bit nervous again!! Ta Da!!! 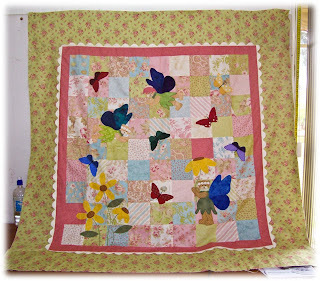 Here is my "Fairy Bears & Butterflies" quilt top hanging on Rosalie's design wall. (had a little bit of design wall envy happening and now with Stina's too!!) I'm really pleased with how this design has come together! You're all aware of my love affair with the Aviary range of fabrics and they are just so soft and dreamy, that I thought some dreamy, magical fairy bears were JUST what was needed. 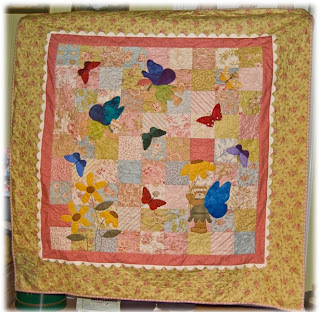 And of course, you can't have fairy bears without butterflies - no garden is complete without both! Tee! Hee! Hee! And I've used some more yummy jumbo rick-rack, too. As soon as the quilt is back from Rosalie's I'll be writing up the instructions and releasing the pattern - which you KNOW means there'll be a giveaway, so stay tuned!! Click on the photo if you'd like a bit closer look at the fairy bears - they're too quick in the garden for you to see, so this is your best chance! Tee! Hee! Hee! And now ... I'm off to pack up some hand stitching to take with me when we head for the beach tomorrow - YAY! 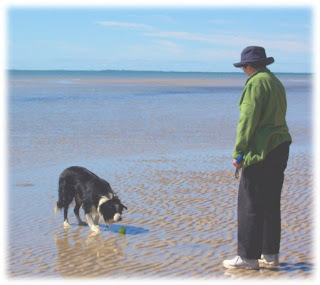 We're sharing a cottage with my folks at Burrum Heads again, where my Beloved GB and Dad will amuse the fish by dangling dead shrimps from hooks, Mum and I will soak up the sun, shop, stitch and enjoy coffees, and Wombat and Lilly will race around the beach like mad things, enjoying the sand and surf - all in all, a great way to take a break from Toowoomba's winter chills! The house-sitter is booked, the clothes are clean and waiting to be packed ... so off I go! I'll be back in a week to see what all my blogging buddies have been up to (or maybe I'll pop into blogland via GB's laptop - if he'll share!!) and in the meantime, I hope you all have a wonderful week, whatever you have planned. Til next time - Bear Hugs! Well ... the renovation noise seems to finally be ebbing here at the Meares' Madhouse and it's mostly safe to come out of the office now! 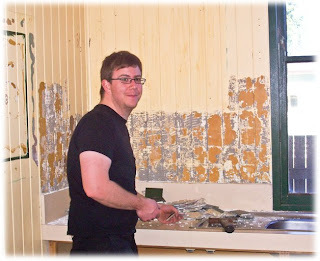 :0) The kitchen doesn't look finished, yet, as we have to move appliances etc back in and for that I need a big burly bloke ... OK ... I'm waiting til my Beloved Geek Boy comes home! Tee! Hee! Hee! Once everything's back and it looks a little more complete, I'll take some more photos, but in the mean time, here are a few more in-progress photos of the reno. Uh oh ... this first one needs to come with a warning - it's one of the most UNFLATTERING photos I've had taken of me in quite some time, but apparently, I have to post it to balance up the one I shared of GB in his daggy renovating gear. So ... bright and early Monday morning (WAY too early for this night owl!!) 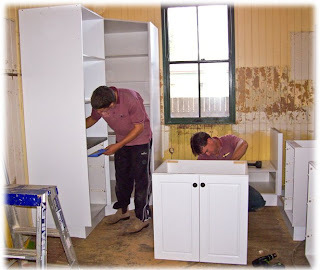 the tradesmen started to arrive to put the new kitchen in. I was at work for part of the time, but this is where things were up to when I got home at lunch time. 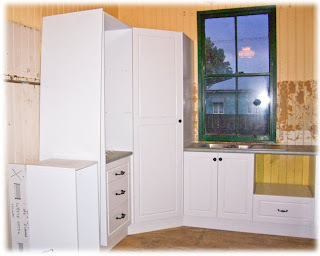 This is where the fridge will go, the microwave unit above some handy drawers and the WONDERFUL corner pantry!! 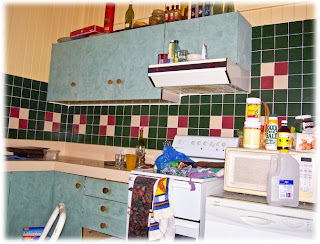 Our old pantry was horrible - narrow, shallow shelves made from chipboard with peeling contact on the top of the shelves - ICKY!! Also space for the new single drawer dishwasher - that won't LEAK like the old one!! This is the other side of the kitchen with my wonderful new length of BENCH SPACE!! YAY!! 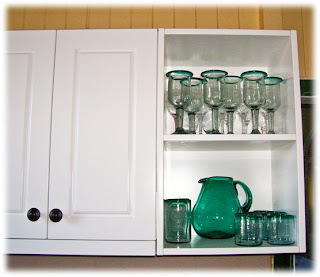 and the nice glass doors on the top cupboards so I can shop off my pretties. Yep ... it's starting to look like a kitchen! Stay tuned and I'll show you some finished photos in a few days! The other thing to happen today, was me dropping in to see Rosalie at Rose Quilting to leave my latest 'baby' with her. Yes ... my new quilt-design-in-progress is FINISHED!! Well ... the top is! So, I thought I'd show you all another sneaky peek that will start to give you a bit more of an idea of where this design led me. Ready?? 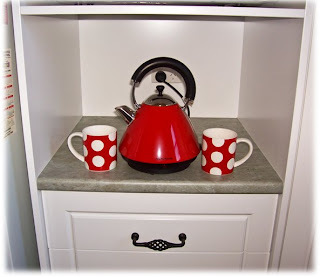 Right now, I'm off to see if I can unearth the kettle from all the clutter to make myself a bracing cup of tea before I start to tackle the renovation clean up. Til next time - Bear Hugs! Or should that be, "rescue me from renovation"?!?! 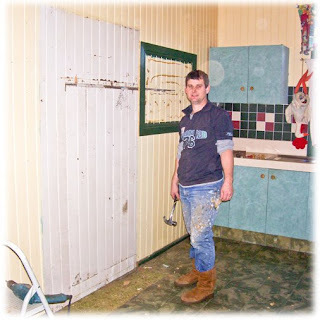 The action I mentioned in my last post that would be going on in the Meares' Madhouse this weekend is well and truly underway - we're getting a new kitchen! Now, everyone keeps saying "I bet you're excited about that." Well ... yes AND no! I'll be excited when the new kitchen is installed and everything is put away in the cupboards, but I can't say I'm enjoying the process very much! The worst part is the NOISE!! 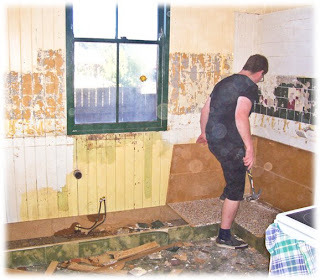 How come renovating is inevitably NOISY!! I'm starting to think it's a 'Boy Thing' - you know how for the most part, boys are noisier than girls? I think this is the 'grown up' version of 'boy noise'!! So I've been doing a lot of hiding out in the office - funny how many 'must do' jobs I found that required the scanner and computer this weekend! Tee! Hee! Hee! And while I can't share the noise with you (bet you're all really pleased about THAT!!) I CAN share some photos of our renovation action, so here we go. That little bit of bench space on the left is where the kettle and water jug sat - no room for anything else!! The other little bit of bench space is all the workspace I've had for seven years - minus the space taken up by the toaster and the George Foreman grill. The cupboards above the bench aren't deep enough for a dinner plate to be stored flat and not high enough for them to be stored on their edge ... talk about impractical design!! 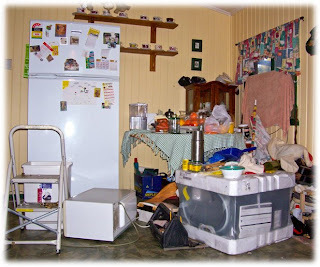 You can see the chaos has already begun with things from cupboards scattered around. OK ... next step ... the DEMOLITION!! 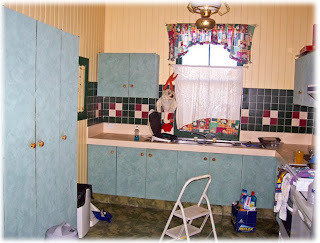 An empty room that looks like a paint factory threw up in it!! 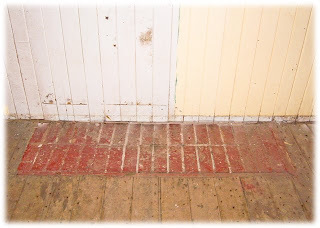 You can bet your boots the colour scheme will be QUITE different after the new kitchen is in and we can paint!! So ... that's our renovation action to date. Stay tuned for updates in the coming days! Hope your weekend is a little quieter than mine!! Til next time - Bear Hugs! A very funky wheat pack!! YAY! Miriam must be a bit psychic, because the night before, my trusty, much-used wheat pack developed a terminal tear and leaked half a wheat field in my bed!! (I'm still finding the odd bit of wheat in my doona!!!) Talk about perfect timing!! Thank you soooooooo much Miriam! Not only do I have a new blogging buddy, I received a lovely gift that warmed my heart ... and my toesies! Tee! Hee! Hee! Three goddesses!! Tee! Hee! Hee! 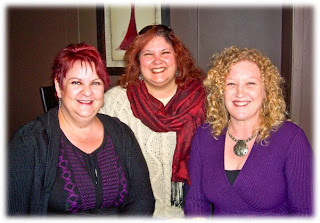 From left to right, there's Deb, yours truly and Lynda. Thanks for a great afternoon, gals!! We'll have to do it again soon!! And a big HAPPY BIRTHDAY to Deb!! And the final "B" for my post is a sneaky peek. OK ... my spelling isn't so bad that I can't see that "sneaky peek" does NOT begin with the letter "B". HOWEVER ... the part of my quilt that I'm going to show you the sneaky peek of DOES start with "B". In fact, I'm feeling generous after my lunchtime outing, so I'll share TWO sneaky peeks that start with "B". Ready?? Ta da!! It's a "B"ear!! And she's found a handy use for one of those yellow flowers I showed you in an earlier post. Are you intrigued yet?? I hope so, because I'm almost finished the embroidery on this fun new design, so it won't be long until I can reveal the finished quilt top - stay tuned!! And that concludes my "B" report today. Why do I suddenly feel like I'm in an episode of "Sesame Street" and Big Bird is about to say ... "Today's show was brought to you by the letter "B" and the number "3" ." :0) I think all that caffeine from lunch has worn off and I need to go and put the kettle on for a nice cup of tea! Oh! ... I just thought of another "B" to tell you ... "B"efore I go, a couple of reminders!! 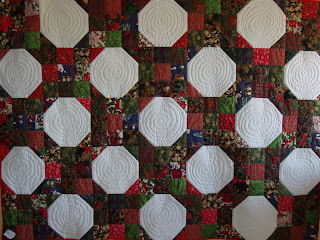 Don't forget to check May Britt's blog to find out who the lucky winner of the end of month prize draw was for the OPAM Challenge for June AND don't forget to start popping into Marion's Quilters Angel blog and website so you can take advantage of her FABULOUS July specials she has planned - I sure will be!!! I hope you all have some fun things planned for the weekend - we've got some major action happening in the Meares' Madhouse, so stay tuned for reports and photos!!! Til next time - Bear Hugs!